Batteries made of lithium and seawater (or just plain tap water for that matter) could be on their way to a marine market near you. That’s courtesy of a technology made by a 11-year-old company called PolyPlus and various partnerships, which hails out of Lawrence Berkeley Labs and has a grant from the Department of Energy’s high risk, early-stage ARPA-E program. At the annual ARPA-E Summit this week, PolyPlus was highlighted as a potential game-changer by ARPA-E Director Arun Majumdar, and I got a chance to sit down with PolyPlus CTO Steven Visco on Monday. The chemistry almost sounds like that of science fiction, but Visco told me in an interview that he thinks the company’s water battery could get to market in two years time, and says the company is just starting the process of producing a water battery pilot production line now. 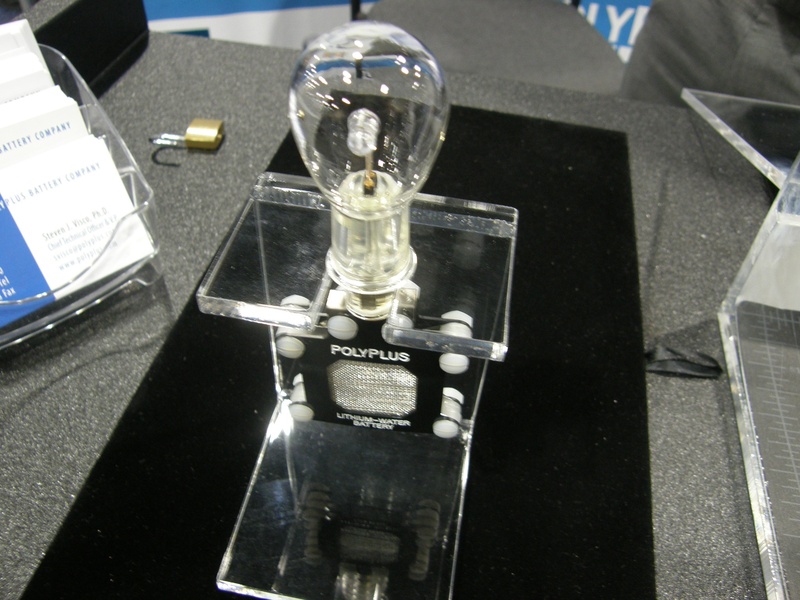 The water battery isn’t even the end goal for PolyPlus; the company is developing a non-rechargeable lithium-air and a rechargeable lithium-air battery, which is the most difficult of the three to manufacture and for which it received the ARPA-E grant. Here’s how the water battery works: An encapsulant encloses the lithium, completely separating it from the water, but still enabling a charge. That’s crucial because lithium and water react rather shockingly (Visco showed me videos of lithium essentially dissolving in water). Visco says it was a Eureka moment when he realized the battery worked, using a membrane from a third party in Japan and the company’s own three-layer system, and was stable in 2003. “Cycling lithium and water was absolutely unheard of,” and after that, the company went “dead silent,” says Visco, and turned to filing patent after patent. A water battery can achieve awe-inspiring energy densities (the amount of energy that can be stored in a battery of a given size) of 1,300 wh/kg (for small batches), and potentially 1,500 wh/kg at larger scale production. For comparison, standard lithium-ion batteries have closer to 200 wh/kg to 400 wh/kg. That means a water battery can last a very long time. Picture a battery used for a device on the outside of a ship, or an underwater unmanned vessel that needs power (hello, DOD), that can just keep going and going. The water battery also doesn’t have to carry the positive electrode, or the water, inside it. 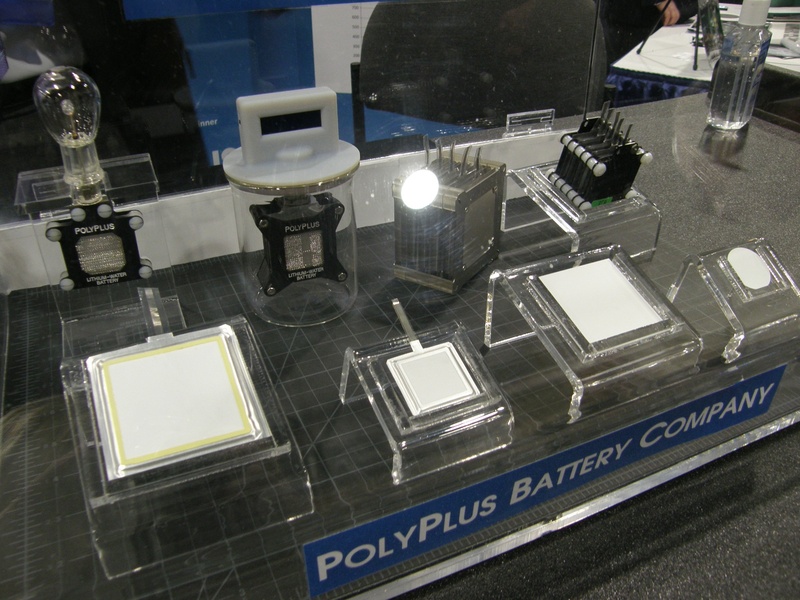 PolyPlus’ water battery has an open system where the water of the surroundings connects with the lithium. That means the battery could be more simple and lower cost to produce. All in all, Visco thinks the marine battery market could be half a billion dollars. That could be overambitious, as many of the applications we discussed are early-stage themselves. But a battery expert source I talked to about PolyPlus’ water battery thought the device was well on its way and could be a big hit for the company. The rechargeable lithium-air battery, for which it received the ARPA-E grant, could be considerable harder. Though the dream is even bigger: a battery that one day could make electric vehicles with ranges from 300 to 500 miles. If PolyPlus gets there, it will be at least five years away, and perhaps two decades before car markers start using these types of batteries for EVs. It took an innovative car company like Tesla (s tsla) that long to put standardized lithium-ion batteries into EVs. Still, you have to wonder why PolyPlus hasn’t moved into manufacturing before this. Visco told me the company doesn’t want to be just a licensing company, but wants to be manufacturer and is in the process of raising funds from VCs and strategic investors right now. When the funding round are closed, hopefully, the water battery will be on its way. Being able to make a trip from Pittsburgh to NYC (370 miles/ 595km), or the round trip to DC (496 miles / 790km) or any other similar distance makes EV viable. Why not license the technology AND manufacture? Licensing to multiple companies could really help kickstart a huge market resulting in a win-win-win for PolyPlus, partners and mother earth. i really hope a breakthrough that can be commercialized comes in the next number of years. This looks like a crazy technology, but this is usually how the breakthroughs come. Battery tech will surprise us very soon. Much higher density and faster charging is now around the corner.